Bangkok has often been called the Venice of East, but over time many of the canals in the city have been filled in to make roads, so it is nice that this part of the city has retained the charm of living along the banks of serene canals. Take a long-tail boat and explore the myriad waterways. Bangkok Noi Canal flows in a horseshoe shape through the old Bangkok Noi community in the Thonburi area. The community was established in the Ayutthaya Period and King Chai Racha Dhiraj (1534-1546) commanded the excavation of a waterway from Bangkok Noi Canal to Bangkok Yai Canal as a shortcut to facilitate transport and communications. Along both banks of the Bangkok Noi Canal, visitors see places of cultural and historical significance. 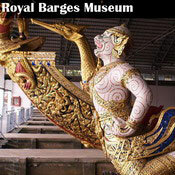 On a boat trip you can pass the Thonburi railway station and the Royal Barges Museum. 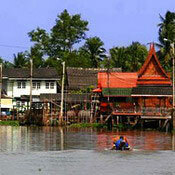 The boat trip also takes in several major temples and traditional Thai houses with carved designs. Although cargo boats now use the direct route along the Chao Phraya River, the lively Bangkok Noi Canal community still endures. It reflects a bygone Thai lifestyle, inextricably related with waterways, and a Thai identity handed down from generation to generation.